Mammals first evolved at about the same time as dinosaurs, and their story is perhaps the more fascinating of the two–in part because it is also our own story. 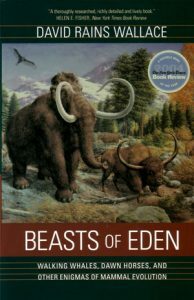 In this literate and entertaining book, eminent naturalist David Rains Wallace brings the saga of ancient mammals to a general audience for the first time. Using artist Rudolph Zallinger’s majestic Age of Mammals mural at the Peabody Museum as a frame for his narrative, Wallace deftly moves over varied terrain–drawing from history, science, evolutionary theory, and art history–to present a lively account of fossil discoveries and an overview of what those discoveries have revealed about early mammals and their evolution. Artist/Author: Lacey, Eileen A. and Philip Myers. 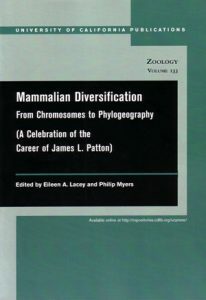 James L. Patton served as Curator of Mammals in the Museum of Vertebrate Zoology, and as Professor of Integrative Biology at the University of California, Berkeley, from 1969 until 2001. This book aims to bring to life both the distinguished career and the distinctive personality of this evolutionary biologist. It contains original research papers. Artist/Author: Duff, Andrew and Ann Lawson. 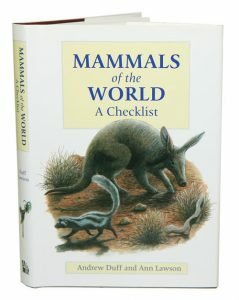 This book is a complete listing of all recognised mammal species in the world and covers 5,027 species. English and scientific names are given for each species as well as a brief summary of each species’ range. An invaluable reference.